The Hamzanama, or 'Book of Hamza' was commissioned by the great Mughal emperor Akbar in the mid-16th century. The epic story of a character based very loosely on the life of the uncle of the Prophet Muhammad chronicles the fantastic adventures of Hamza as he and his band of heroes fight against the enemies of Islam. The stories, from a long-established oral tradition, were written down for Akbar in Persian, the language of the court, in multiple volumes. These originally had 1400 illustrations, of which fewer than 200 survive today. Work probably began in about 1562 and took 15 years to complete. The only text to have survived from Akbar's commission is that pasted to the back of each painting. So much of the original is missing that it is now difficult to follow the complex narrative, which has many stories within stories. 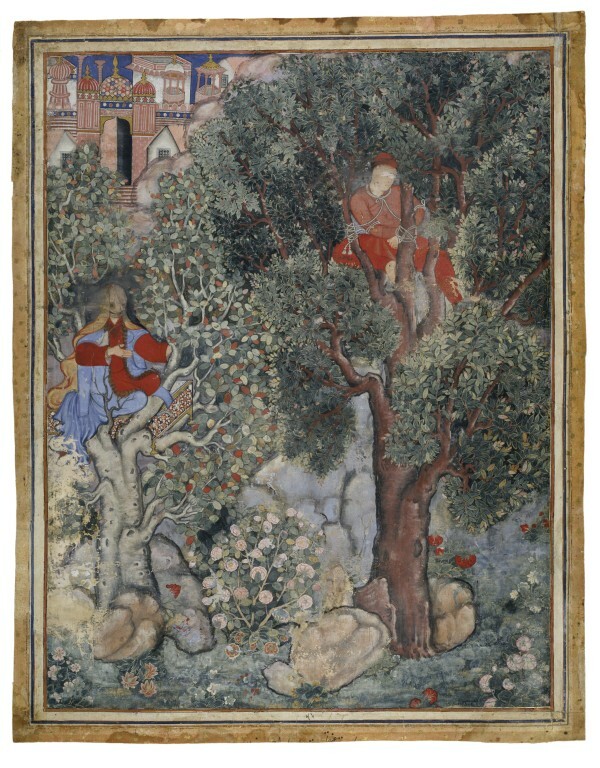 This illustration shows the witch Anqarut in the guise of a beautiful young woman, who hopes to seduce the legendarily handsome young king Malik Iraj, whom she has captured and tied to a tree. 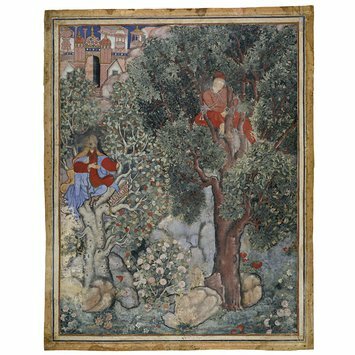 Two figures perch in the upper branches of trees whose foliage fills most of the composition. On the left, the witch Anqarut has assumed the guise of a beautiful young woman. 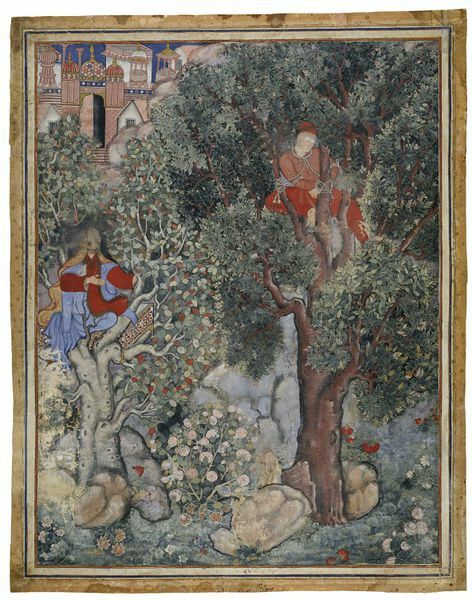 On the right is her captive, the young king Malik Iraj, whom she has bound to the tree and is trying to seduce. Both their faces have suffered later disfigurement. An illustration to the epic romance, the Hamzanama, ca.1562-1577. Bought for the museum by Caspar Purdon Clarke in Srinagar in 1881. The 'Hamzanama' was the first major project undertaken by the new painting studio of the Mughal court. Directed by two Iranian masters brought to Hindustan by the emperor Humayun, work began under his son, Akbar, and took fifteen years to complete. Seyller, John. The Adventures of Hamza. Smithsonian Institution. 2002, cat. 81, pp. 242-243. Stronge, Susan, Painting for the Mughal Emperor. The Art of the Book 1560-1650, V&A Publications 2002, pl. 13, p. 28.